Introducing Waffle Church | gather the folks. tell the stories. I am doing another new thing! The community of St. Lydia’s Dinner Church in Brooklyn discerned over the past year a need to create worship opportunities for people of all ages. Their discernment led them to Waffle Church, and amazingly, to me, to serve as the Pastor for Waffle Church. We will be workshoping Waffle Church this summer and beginning a monthly service this fall. If you would like to be a part of Waffle Church, please let us know! And if you can’t be here to stir waffle batter or lead song or make play doh, you can donate to help us get this (and two, other new services at St. Lydia’s) off the ground. is greatest in the kingdom of heaven. Last year, I took my three year-old son, Henry, to a small church near our home. The pews were sparsely populated by an aging congregation. There were no other children; no Sunday school; no children’s message. I packed an arsenal- toy cars, Goldfish, crayons, more Goldfish, and, for emergency use only- my iPhone. Henry fidgeted; he rustled the bulletin; he dropped his metal cars on the wooden pews; he asked questions. This was in the first five minutes. I shushed. I sweat. I pleaded. Please sit still. Please be quiet. My three year-old did the best a three year-old could do under the circumstances. I did not. I was so worried about disturbing the worship of the adults around us that I paid no attention to what was taking place in front of me. It came time for the unison prayer of confession, and I stood up, bulletin in hand. Henry climbed on the pew, standing next to me, and as the congregation intoned the somber prayer, Henry sang the theme song to Thomas the Tank Engine. I was mortified. I don’t remember the rest of the service. It wasn’t until later that night that I realized what had happened. Henry had joined us in prayer. He can’t read; he doesn’t understand theology. But he understood that all the people were standing up and saying something together, and he joined in, in the best way he knew how. Through all the rustling and fidgeting and dropping things, Henry was paying closer attention to worship than me. This is a new experience for me- having my kids in worship. When I was a pastor in a large congregation, I entrusted my children to my wise and compassionate church colleagues and a coterie of lovely volunteers. My kids received great religious education, learned some beautiful songs by heart that they still sing, and made friends. But since we’ve been worshiping together as a family this past year, their spiritual lives have erupted. It was the opposite of what I had expected, in fact. I expected that being out of a large and well-managed church school program, my kids interest in church would atrophy and fall away completely. I was, to be honest, desperately sad. But then Henry joined in the corporate prayers of the church with his rendition of the Thomas theme song. And he began asking when the ‘feast’ would take place, though I had never, ever referred to communion with ‘feast’ language. Claire began singing a song from our new church, unbidden. They often remind my husband and me to say or sing grace at the table. They talk about Jesus. They ask questions about God. They still fidget and talk and drop crayons and toy cars. But if we can tolerate the disruption, the payback is extraordinary. There is a rich trove of literature focused on the spiritual lives and religious potential of children that suggests that all children have a tremendous potential for real spirituality– an intuitive sense of God and a deep longing to know God. So great is their capacity for knowing and seeking God, that it is Jesus who calls us to be ‘like children’ in order to enter into the kingdom of heaven. Where did that child come from? Was she in the crowd with her parents? Were there other children there? Were there usually kids near Jesus when he was teaching and preaching and eating and healing and casting out demons? Did they have Sunday school in the early Christian community? Did ‘house churches’ have childcare rooms? Or were children underfoot, capturing, as it were, the crumbs from the table? Were the children telling stories, playing make-believe, wondering about Jesus in the same way their parents did? Were they doing what all children do– being curious, using their imagination, asking their parents questions that their parents couldn’t answer? But the child was in their midst, and belonged there, by Jesus’ exhortation. Not symbolically, but, as my kids will say ‘in real life.’ Children, in the context of Jesus’ ministry, have something vital that adults cannot easily access. My favorite writing on children’s spirituality is Sophia Cavaletti, who was writing in the Roman Church in the late 1970s and informed richly by the work of Maria Montessori. Her book, The Religious Potential of the Child, was a precursor to Godly Play and Gretchen Wolff Pritchard’s beautiful book, Offering the Gospel to Children. In Cavaletti’s observations, children are able to enter into a relationship with God that goes beyond the intellectual plane, but is founded on a deep, existential level. They can tolerate ambiguity and mystery in ways that we cannot. Fantasy and reality are not at odds with one another yet, but move in and out of consciousness with fluidity. Children belong in the midst of the community of faith, alongside others deemed outsiders, powerless or insignificant. Not as charity cases, but guests in the seats of honor. For they know, better than any of us, what the kingdom of heaven looks like. That’s why I’m so excited about Waffle Church. Not to teach children about God, but to learn from children about God… My head is stuffed with seminary classes, and thousands of sermons, and unhelpful tools like logic and sophistication and, God help me, maturity. I know words like symbol and metaphor and allegory and parable. But I’ve lost my wonder. And my imagination. And my creativity when it comes to thinking about God. I need new teachers. There is a mutuality in this endeavor. It is our job as adult members in this Christian community NOT to introduce children to a subject they know nothing about (because we believe that they, in fact, know A LOT), but to provide them with the tools- images and stories- that will allow them to work with their own experience, and yearnings, to speculate and to wonder, and (in their own way) to build a conscious, articulate faith. And the children, in turn, will teach us how to encounter the mystery of God with wonder and awe; allow us to work with our own experiences and yearnings, and (in our own way) to build, or rebuild (as the case may be), a conscious and articulate faith. And in so doing, give to us new eyes, and new hearts, and new ways to welcome God among us. You all at St. Lydia’s are so good at this already. As a worshiping community, you already embody the experiential practice of encountering the mystery of God. You use all of your senses; you encourage curiosity; you make space for improvisation and imagination. You not only welcome the outsider, you save her the seat of honor. Waffle Church is not a stretch. It will be a new thing, but it will really be simply an extension of what you are already doing. Waffle Church is NOT children’s church. It will, I hope, distinguish itself in that way. It is not a church just for families. We may not all have children, but we have all BEEN children. That is our commonality. We have all been invited into the lap of God and welcomed as we are, without need to prove ourselves worthy by reciting back our knowledge. We sit in the lap of God as children—pure-hearted, yearning, curious, open, and joyful. If we value children’s potential for religious experience, worship together will be meaningful, complex, unresolved, and challenging. And, it might also resemble kindergarten- with movement and fluidity and the deployment of tactile expressions of faith. The best of both worlds. And Waffles. We can’t forget the Waffles! This entry was posted in Bible Study, Discipleship, Sermons, St. Lydia's, Waffle Church and tagged Cathechesis of the Good Shepherd, children, Godly Play, Gospel of Matthew, Greenpoint Reformed Church, Gretchen Wolff Pritchard, Messy Church, sermon, Sophia Cavaletti, spirituality, St. Lydia's, Waffle Church, Waffles, worship. Bookmark the permalink. This sounds amazing. Would love to know more of your liturgy-and how you are going about doing this. Thanks! I’m happy to share ideas and plans. Pingback: Picky Eaters | gather the folks. tell the stories. 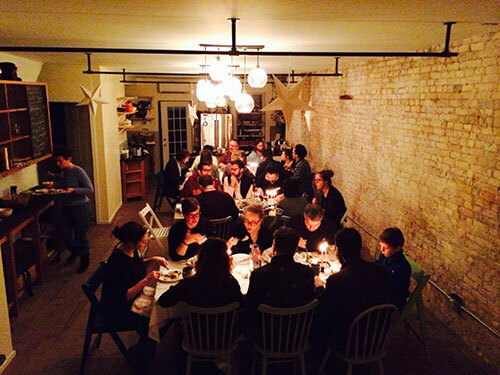 Pingback: Looking for Good News Under the Table | gather the folks. tell the stories.